We’ve began the year by running the Oculus Rift through its paces with the completion of our VR documentary Common Ground. The 30 minute experience incorporates stereoscopic 360 video, photogrammetry, 3D modelling, 6 degrees of freedom, 3D modelling and interactivity. This type of VR experience, where the user gets to move around the space and interact with the film in a gamified way, needs a great deal of processing power and therefore requires a PC based VR headset, as opposed to a standalone or mobile phones based headset. We developed the experience on the Oculus Rift but there are many alternatives, which we will look at below. The most interactive VR experiences require a PC based headset which means that they are powered by a PC. This means that everything is run from a computer, from the software that plays the experience, to the video, spatial audio and the processing. This often requires cables to connect the headset to the computer, and also sensors which are again cabled to the computer, that enable motion tracking and 6 degrees of freedom (being able to move around in the virtual world). The key thing with these headsets is that they do require a pretty powerful gaming computer, so before you even buy the headsets you will have to invest in a machine (or hire if you’re a marketer) from at least the £1000+ price point. So which headsets are these? The Facebook owned Oculus Rift is probably the best known VR headset on the market. It comes with 2 touch controllers for interactivity and 2 motion tracking sensors allowing for 6 degrees of freedom (6DoF). It’s perfect for high-end VR experiences (which is why we used it for the development of Common Ground) and is now at a pretty accessible price of £399. It also has access to a pretty amazing array of content via the Oculus Store, as well as Viveport and Steam VR (more on that below). HTC is the other big player in the world of fully interactive VR headsets. 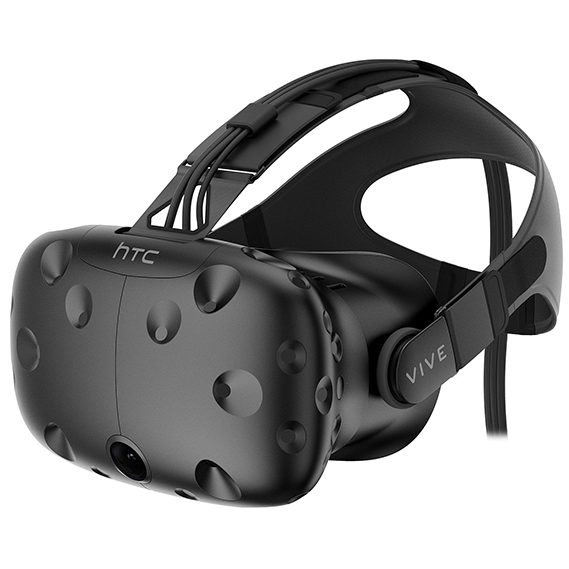 Nowadays the HTC Vive and Oculus Rift are very similar headsets in terms of their capabilities. The Vive used to always come out on top as the trackers and controllers came as standard, whereas you had to buy them as extras for the Rift, but since the Oculus package provides them all, there is very little to differentiate the two. The Vive is however a little more expensive at £499. It has access to the Viveport and Steam VR for content, but sadly not the Oculus Store, which means the Rift comes out on top when it comes to content. As the name suggests the Vive Pro is the professional grade and next generation of the Vive headset. The screens are a higher resolution (1440x1600 per eye as opposed to 1080x1200), it has higher quality headphones and it has an optional wireless adapter, meaning that you no longer need to be tethered into the computer. The cherry on the cake is the LED sensors around the lenses which enable eye tracking, meaning that your eyes can act as the controller. Naturally this all comes with a premium price of £1,299 but it really is the best headset on the market currently. If it’s all about gaming VR then the Playstation VR might be the headset for you. Although not strictly a PC, this headset plugs into the Playstation 4 and has a pretty good selection of games. It comes with only one sensor so moving around isn’t as responsive as the Vive or Oculus (which both have at least two sensors), but if you already own a PS4, then at £239 it’s the cheapest route into interactive high end VR. And Sony are the only folks to publish sales figures, stating that there have been over 3 million headsets sold, which is pretty decent. I lump the WMR headsets into one as they have all been developed by Microsoft’s PC maker partners to fit with Microsoft’s specific design requirements. So essentially they’re all pretty similar. Unlike the Oculus and Vive, WMR headsets use a pair of front-mounted cameras and a set of built-in sensors to map your movement to enable inside-out tracking. This tech allows for 6DoF movement tracking without the need for external sensors, which is pretty helpful when you don’t have a lot of space (and hate cables). At around £250 and requiring a middle of the road PC, the price is much more accessible too. Don’t hesitate to get in touch if you want to discuss any of these headsets and how they might fit into your project. We’re here to help.